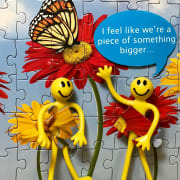 Puzzler's Exchange provides a perpetual supply of large-piece jigsaw puzzles to facilitate social connection that is cooperative, calming, and enjoyable for those living with complex health challenges, and their caregivers. Puzzler's Exchange is looking for Board Members who resonate with our mission and vision and love to do puzzles. You know who you are! Puzzler's Exchange became a Minnesota 501(c)(3) non-profit in April 2018. There shall be staggered Directorships beginning and ending at Corporation’s annual meeting. In order to create staggered terms of office, at the 2019 annual meeting approximately one-half (1/2) of the Directors shall agree to serve a one (1)-year term, and approximately one-half (1/2) of the Directors shall agree to serve a two (2)-year term. Thereafter, all Directors shall serve a two (2)-year term. There shall be no limit to the number of terms a Director may serve. The Board of Directors shall meet at least quarterly, or (4) times each year. No compensation shall be paid to Directors of Corporation for their services, time, and/or efforts. Directors, however, may be reimbursed for necessary and reasonable actual expenses incurred in the performance of their duties.